SPRINGFIELD, Mass. – DJ Steward is building a solid relationship with Notre Dame assistant Ryan Humphrey. The 2020 Chicago guard has already made the trip down to South Bend a few times. The 6-foot-1, 165-pounder said he will get back “for sure” and hopefully as soon as the spring. “Just all around the campus, just seeing everything, the environment,” he said of what he wants to check out next time. 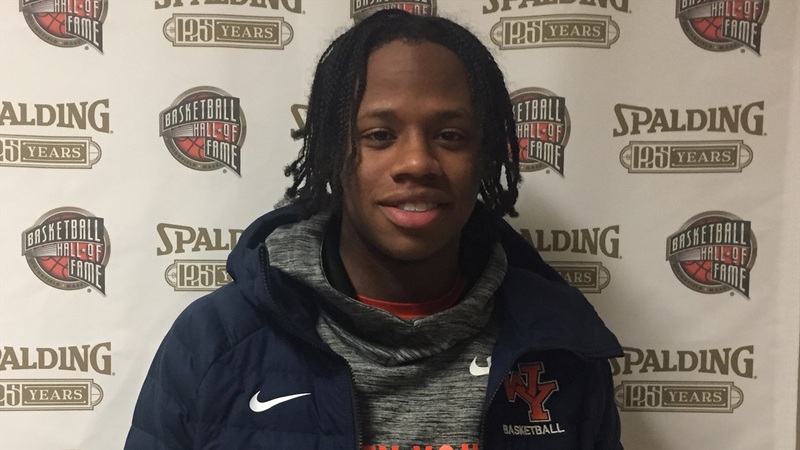 The Whitney Young High School standout currently has offers from schools like Illinois, DePaul, Marquette, Florida, Georgia Tech, Texas and Saint Louis while also receiving serious interest from schools like Northwestern, Michigan State and Virginia. He’d love the opportunity to add the Irish to that offer sheet. He isn’t going to rush the process and said his relationships with coaches and players will be most important when he makes his choice. Steward enjoyed his trip to the HoopHall, where his Whitney Young squad beat The Maret School 54-46 on Sunday. He did have one of the highlights of the game with a driving dunk over a defender. “I changed my mind at the last second about dunking,” he laughed.